This is the first in our new series of Japanese food recipes. Over the next few months, we’ll be showing you how to make the tastiest and most popular dishes out there. Feel free to leave comments at the bottom with any useful suggestions or tips. 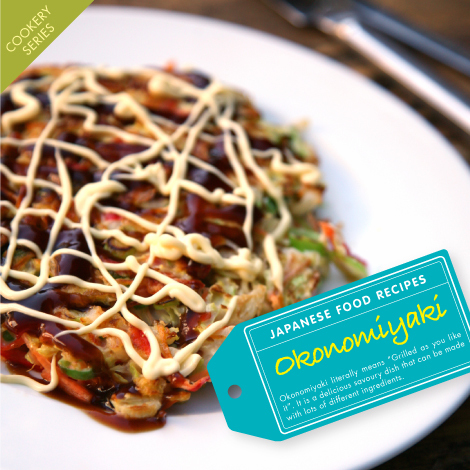 Okonomiyaki literally means “Grilled as you like it”. It is a delicious savoury dish that is simple and quick to make. Very versatile, it can be made with many different ingredients to suit your own tastes. You can buy many of the ingredients at Japan Centre, just click on the link to add it to your basket. • Any Meat, Seafood or Other Vegetables such as Sliced Pork, Bacon, Squid or Prawn etc. • Optional Ingredient: Tenkasu (deep fried flour dough) – Add at step 3. • Optional Toppings: Pickled ginger (beni shoga), Aonori (powdered seaweed) – Add at step 7. 2. Chop the cabbage and spring onion finely and add to the batter mix. 4. Start heating a pan and pour the mixture into a round pancake. 5. If using meat or seafood, start cooking these separate to the pancake. 6. After 5-7 minutes of cooking, add the meat ingredients to the top of the pancake and flip over to finish cooking. 7. Serve after smothering with Okonomiyaki sauce, mayonnaise and sprinkle with bonito flakes. You can print this recipe and even bring it to the foodshop to find the ingredients. Posted in Food and tagged okonomiyaki, recipe, Recipes. Bookmark the permalink. Great recipe! If you’re interested in variations on Okonomiyaki recipes – and different ways to make the batter if you don’t have Okonomiyaki flour, check out http://www.okonomiyakiworld.com. Have fun! Thank you for the Okomomiaki recipe. It was my first meal in Japan,and i have wanted to make it since my return. To any one who has not had this dish,give it a try. i just love okonomiyaki!! !they are so tasty and easy to make.my recipe is almost the same but i also add a little bit of corn and cheese like for a pizza(but mixed together,not as a topping).mayo and sauce from japan centre is essential!! by the way-i adore the recipe idea! !i am hoping to find the recipe for chilled soba salad someday.it’s a great dish for summer. Okonomiyaki cooked together with Yakisoba noodles is known as Hiroshima style Okonomiyaki. Slightly different to the Kansai style we made a recipe for, Hiroshima style of Okonomiyaki is made in layers rather than mixing all the ingredients together. Hiroshima style also includes a larger amount of cabbage, a layer of Yakisoba noodles and a fried egg on top! Both are delicious and easy to make at home so I hope you enjoy our recipe! Loved the recipe worked great! Had it for brunch today. Recipe Flyers Now In Store!